Embed a free group chat on your website or blog. Boost user engagement on your website by talking to your visitors, or create a chat to discuss a topic. Minnit features extensive customization, and the ability to embed your chat on your website or blog. Our service is free, easy to use and we're committed to providing a great experience for everyone at no cost. Minnit was built using HTML5 and is supported on all major browsers. Embed your chat on your website or blog via an iframe with just a few lines of code. No support for iframes? You can provide the link to your chat and users will be able to join, even if they aren't registered. Own a Wordpress blog? 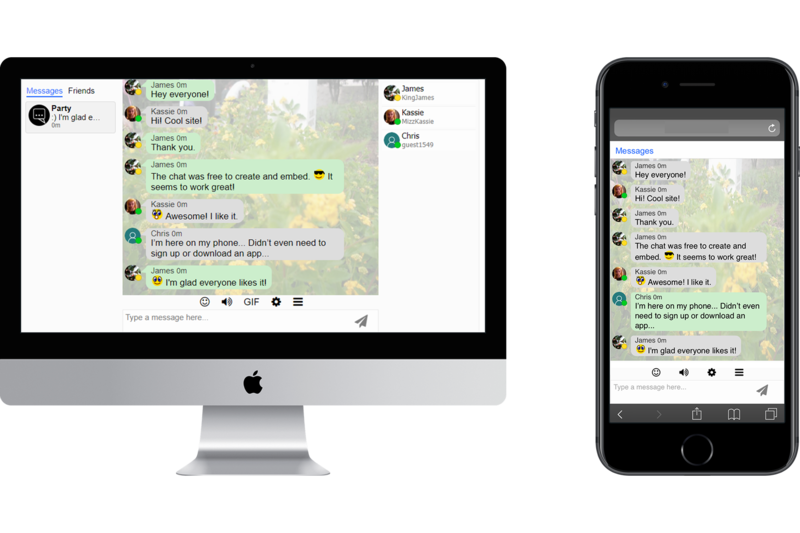 Check out the Minnit Chat Wordpress Plugin! Use Cloudflare? Check out the Minnit Chat Cloudflare App! Changes to chat settings happen in real time for users on your chat. This means that changing your background, theme, staff ban time, etc doesn't require anyone to refresh to see the changes. Have multiple chats open in different tabs? No problem. Your incoming and outgoing direct messages, changes to your smiley customization, friends/ignore list, and preferences are all synced across tabs. It's hard to have a discussion when there are many users in a chat talking at the same time. We've got plenty of features to keep your users coming back again and again. We host the chat for you, so it doesn't affect your server usage. Registered users can customize their smilies with color options, different eyes, hats, and glasses. We usually reply to all support tickets in a few hours. Minnit employs the best security practices, including the use of HTTPS to keep your data safe. Trying to get more visitors on your website? Your chat will show up on our listings and users who aren't from your website may join. Choose a plan that suits your needs. You can upgrade/downgrade at any time. Note: If your chat frequently goes over 50% of your allowed users per your plan, and you're on a discounted plan, you will forfeit your access to the discount If you are embedding your chat onto a personal website (light use), or you are a valid non-profit organization, you may be entitled to a 50% discount. Create a chatroom to learn more. Pay annually to get 2 months free! Do you need even more out of your chat? Do you need a custom-built feature? Ask about our Enterprise plans -- prices may vary. Try out all of the premium features for seven days. No payment information required. Set up your Minnit Chat, test out the features, and see if Minnit Chat is right for you, and which features you will need. And, if you ever have questions or need assistance, you're able to contact our Support Team -- we're always happy to help. You can visit and edit your chat while these changes are being applied. For any questions, contact Minnit Chat Support. New users can use the free trial to try out all of the premium features. No payment information is required to get the free trial. This includes all features on the Pro plan, however maximum simultaneous users will be limited to the same amount as the Free plan. The recurring billing date will be the current date. For example, if you sign up for a monthly plan for the first time on January 1, all future charges will be billed on the 1st of every month. At the beginning of the next billing cycle, you will be charged the full cost of the upgraded plan for that month in addition to the pro-rated cost of the new plan minus the pro-rated amount paid on the previous plan. At the beginning of the next billing cycle, you will be charged the full cost of the lower priced plan for that month minus the amount of credit from the pro-rated funds previously paid. Can I change from monthly to annual billing or vice versa? You can change your billing frequency from monthly to annual, but not the other way around. If you need to switch from annual to monthly billing, please contact us. What happens when I switch from monthly to annual billing? If you switch from monthly to annual billing, your next billing date will change to a year from the time the change was made, and a payment will be attempted for the amount owed. For example, if you paid for the Basic Monthly Plan on June 1 2018 and switched to the Basic Annual Plan on June 6 2018, your next billing date would become June 6 2019. In addition, you would be charged $92 ($100 - (($10 - ($10/30 * 6)))) immediately. For example: You subscribe to the Basic plan ($10/month) on June 1st and upgrade to the Pro ($30/month) plan on June 15th, with your next billing date being July 1st. On July 1st (your next billing date), the pro-rated amount due ($10) will be added to the cost of the new upgraded plan ($30) and you will be charged $40 in total. For example: You subscribe to the Pro plan ($30/month) on June 1st and downgrade to the Basic ($10/month) plan on June 15th, with your next billing date being July 1st. On July 1st (your next billing date), the pro-rated credit will be applied due ($10) will be added to the cost of the new plan ($10) and you won't be charged for this month. All purchases are deemed final at the point of sale. Users who purchase a year-long subscription, for instance, will pay for the entire year up-front, and are not entitled to a refund. If the user opts to cancel their subscription, they will retain premium features for the duration of their subscription period. In some circumstances, we may issue a partial or full refund. Such decisions are handled on a case-by-case basis. All requests must be sent directly to Minnit LTD via our Support System. What happens if I get more users than my plan allows? If you get users in excess of what your plan allows, they will not be able to join your chat. If this happens to you, you can upgrade your plan and they will be able to join. We do not automatically upgrade you to the next plan. You can choose to upgrade your plan, or you can wait until some users leave the chat to allow new users to join. All payments are securely handled by Paddle. Minnit LTD does not view, scan, or record your payment details. What's happens if my chat hits the bandwidth limit for file sharing? If your chat reaches the bandwidth limit for file sharing (e.g.) 10 GB on the free plan, users will no longer be able to share files on your chat. We will not automatically upgrade your plan. You can choose to upgrade to the next plan to get additional bandwidth, or wait until the next month for the bandwidth used to reset.